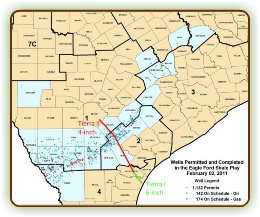 One of the Largest Domestic Discoveries of Oil in the Past 40 Years, the Eagle Ford Shale is a significant hydrocarbon producing formation due to its capability of producing both more gas and oil than other traditional shale plays. It contains a much higher carbonate shale percentage, upwards to 70% in south Texas. As it moves across Texas to the northwest, the play becomes shallower and the shale content increases. The high percentage of carbonate makes it more brittle and easier to frac. The shale play trends across Texas from the Mexican border up into East Texas, roughly 50 miles wide and 400 miles long with an average thickness of 250 feet. Production of crude oil has increased from 842 Barrels Per Day in 2009 to over 7,000 BPD in 2010. Projected to be the largest domestic oil and gas discovery in the last 40 years, a preliminary estimate of production indicates a reserve in the Eagle Ford Shale that could be more than 4.7 billion barrels of crude oil, or roughly twice the size of the massive Bakken shale in North Dakota. That equates to 200,000 BPD for the next 65 years.